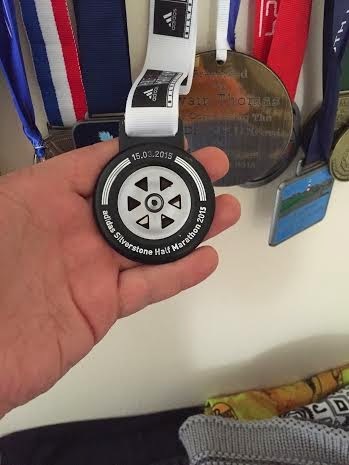 I thought it was now time to review event number 5 of 37 this which I completed at the weekend. 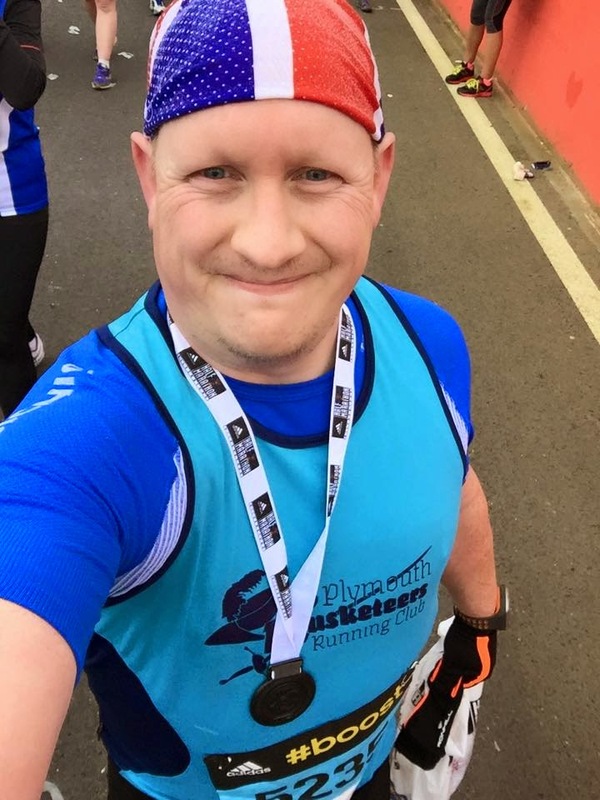 The Silverstone Half marathon was the chosen event in my build up in training towards the ultimate goal later on in the year. When I first heard of this half marathon I had two thoughts running through my head. Firstly, "YES! Another F1 track to run around". Being a F1 fan and having already had the privilege of running around Abu Dhabi F1 track, this was another one on my bucket list. Secondly, "I don't fancy running around a race track 4 times though". Now the second thought came from reading it had 4 laps. However all is not as it seems! Now living down in Plymouth, Devon it is a fair bit of a trek to get to Silverstone. Luckily a lot of members from a running club I am a member of (Plymouth Musketeers) were going and some of us got a minibus organised by one of the other members to get us up there. This however meant we were leaving at 5am to get there in time before they closed the parking at 10.30am before the race started at 12pm. It was going to be a long day! We soon made the journey and arrived at the circuit in good time, but what caught most of us out was the temperature there. It was frigging Baltic! This was supposed to be spring, it felt like a December day. We parked up and made our way after a little walk into the track's ground. With so many people there, the atmosphere was already building. Plenty of facilities, like burger vans, coffee vans, an Adidas Shop etc all set up. 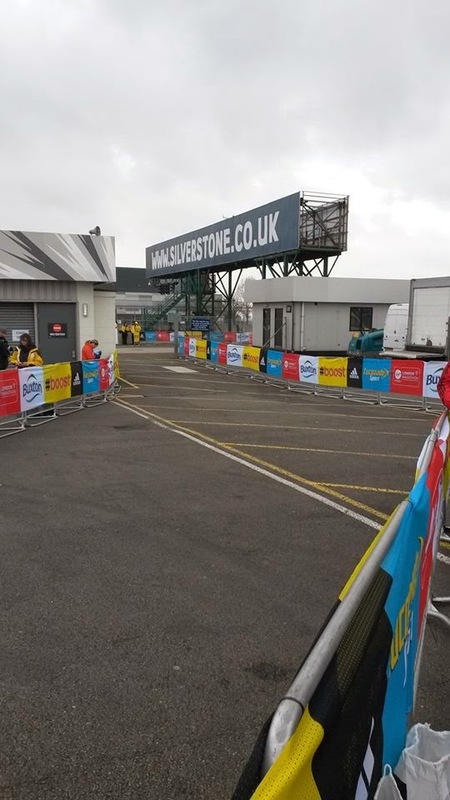 One of the race garages was sett up as a changing area, and others set up for the bag drops. As others from the club arrived who travelled up seperately the night before, we soon all met up. All of us chatting about the race, how we are going to tackle it. Who was going for PB's and who was just out to enjoy it. I wasn't the only one out to just enjoy the race and wasn't PB chasing which was nice to know. Not going for a PB on a pretty much flat course which has PB all over it? Yep my season this year, is definitely not about PB hunting. If it happens then so be it, but I'm not chasing them. Sometimes I've not enjoyed or appreciated an event in the past because I was too focused on my performance or trying to go balls out to get a PB. It's not until you go out to just enjoy the event and the atmosphere you start to learn how awesome most of them really are. At 11.15am I get changed, and put my stuff in the already provided race bag. They sent through a race pack prior to the event. This included your number, timing chip, race bag, and race information magazine. So when I got there, there was no queuing for registration nor any real hassle. Soon the announcement that the Wheelchair races was started with Dave "Weirwolf" Weir amongst those athletes. Not long after they called the runners to the start. They separated the runners starting positions to sub 2 hours and over 2 hours. Regardless of what time I was planning on doing it in I was going to go in the sub 2 hours as it will soon spread out quicker than being stuck at the back. I went around the 1.58 pace maker, as this was a good comfortable time for me and more than capable of. So finishing anywhere around that time either less or more would be fine and happy with. On the start line waiting for "go, go, go!" That was it, we were off! Not too long after the gun had gone, I was soon crossing the starting line. It was still reasonably busy but with such a wide track it wasn't long until gaps appeared and space was found and I started to settle down. Being a GP track it wasn't going to be hilly, but with the cold temperature and overcast skies, I prayed it wouldn't poor down and make things too uncomfortable. The course had two different atmosphere's. The first was when you hit the spectators, they were awesome. The children holding their hands out for high fives, the adults clapping and cheering on all the strangers they have never met before. Having a 4 year old son who loves marshalling parkruns and other events I know how disappointed he gets when he sticks his hand out for high fives and some runners leave him hanging. Seeing a little girl no older than my son doing the same, I looked to see if the nearest runner would high five her back as she sat on her dad's shoulders. No the runners didn't and she looked so sad. I stopped turned around and went back and gave her that high five she wanted. It was my way of thanking her for coming out to support who ever she was supporting and for cheering everyone else on in the cold bleak day. Her face lit up and a little voice said "thank you". That there already made my race. I made my way round the course, passing dj's entertaining supporters and the runners. The most unusual and unexpected thing to hear and see was a Bollywood style band singing and playing " We will rock you" by Queen. It made me chuckle but also made me think WTF! I was now over half way and starting to think about picking my pace up a little to finish strong, until I caught up with a fellow club runner. "Alright Vic?" I asked as I started to pass him, "Starting to struggle Owain" came his reply. "No good Vic, I will keep ya company" I replied. It didn't matter how many times he told me to go on. I didn't leave him. One thing I learnt during my time running, is runners are just runners to each other, they are friends and family. As the miles ticked, and with the weather not improving but not getting worse, we plodded on to the end. The track well marshalled but some time bland when there wasn't any supporters. I spent most of it taking in the course thinking about various F1 races that went on there. We came to the last mile and we suddenly were hit with quite a head wind, which I wasn't expecting at all. Vic told me to go on again, and once more I declined staying with him as we crossed the line together. We both crossed the line in Sub 2hr 10 mins. Averaging sub 10 min/mile pace was a very nice and comfortable way to run this event.Vic was happy, I got him still under 2hrs 10 minutes so that pleased me too. 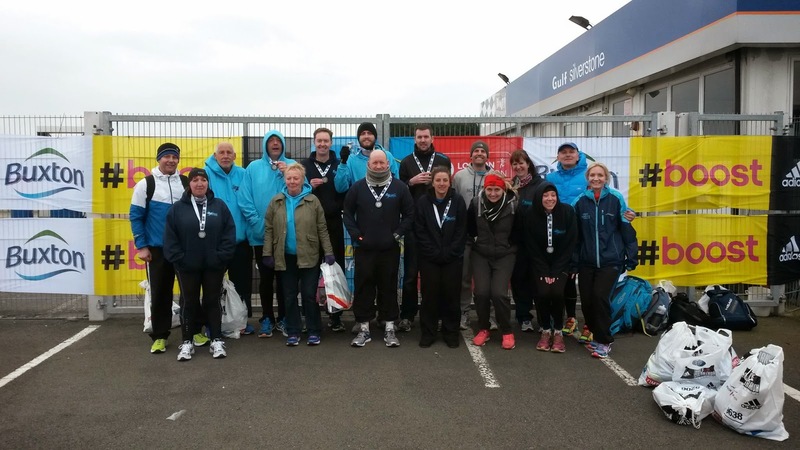 Sometimes giving up your own time to help someone else is far more rewarding than a PB. Now as I said in the beginning the course description says laps, which does put some people off but you actually don't do laps like it sound. You never repeat the same part of the course in teh same direction, some times you go back in reverse but you don't go round in actual laps (see pic). I also ran 13.32 miles not 13.1. A lot of people did this and found it strange but what you need to realise is that when they measure it, they measure the quickest racing line 13.1 miles. so if you don't follow that "line" going wide round the corners and around other runners you will add a little extra on. My Garmin tracking of the course. The kit I wore for this race was my X-Bionic Trick shirt, X-Bionic Running shorts and X-Socks Marathon socks. I chose my British Buff (had to as it was home to British GP), and used my Marvel Heroes Buff as a wristband. 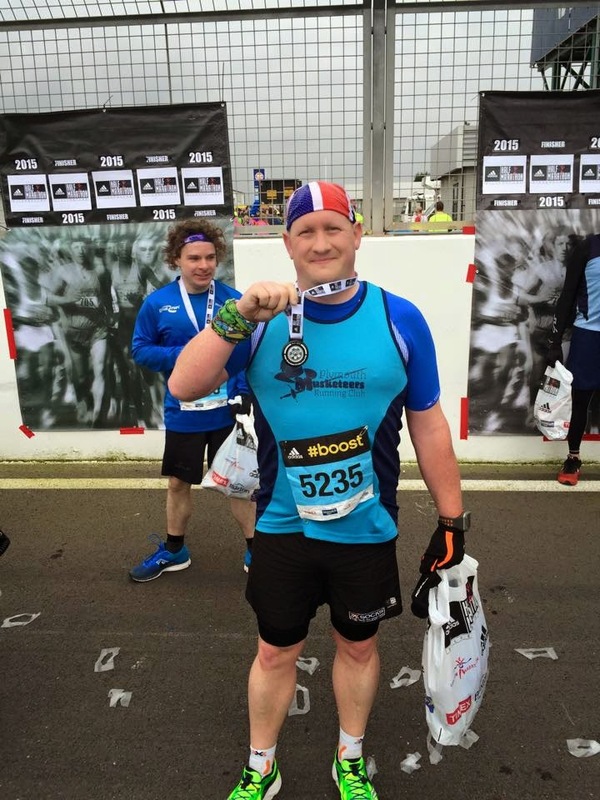 My X-Bionic kit was awesome in the cold, kept me warm enough without making me over sweat. Brilliant stuff! Unfortunately it wasn't sunny enough to wear my new Sunwise Canary Wharf glasses. Now what did I get for my entry money? Great Value I'd say. 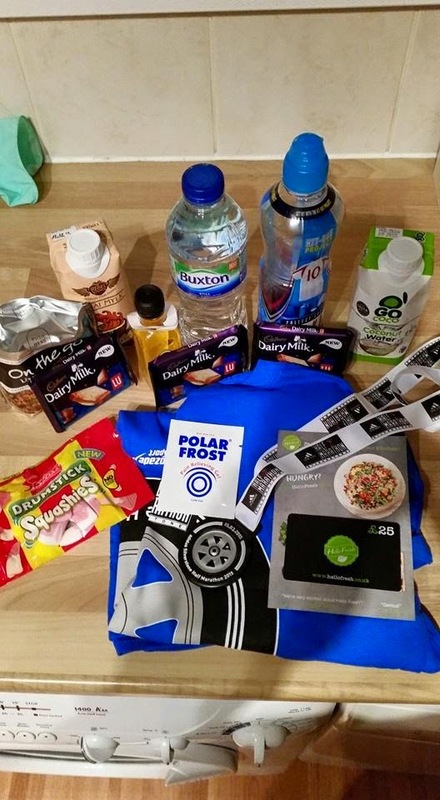 For £20 you received a good race pack to start with, great facilities when you arrived, great support and marshaling at a well laid out course, brilliant bag drops. An awesome good bag, including a brilliant medal and t-shirt. I have paid more for far less in the past that's for sure. After the race, I set off back to Plymouth for another long minibus drive. It didn't matter though because I had good company. One of the good reasons to join a running club! 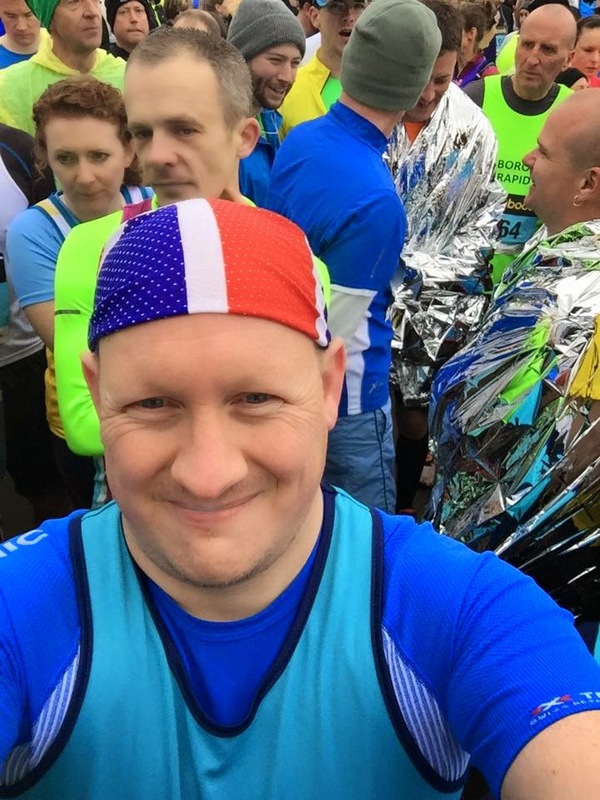 Thank you for reading this blog, I've next got a double event hitter at the weekend coming.